With a little contribution, We'll reduce air pollution! 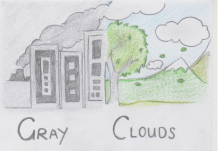 We Gray Clouds are a site created to reduce air pollution. In order to reach our aim, we need the support of others. On this page, information is provided to help you, the general public, reduce air pollution. With this being said, a great deal of support will be needed. We Gray Clouds hope you understand the negative aspects of pollution and hope for you to take action as we are desperately trying do. We would really appreciate it if you took some time to read our tips and take on board some of our environmental information! Below are facts on air polluters slowly killing our Earth, with your help we can help stop them. If you're a polluter then consider changing sides! We need all the support we can get to help blow the gray smoke over! People are smoking more and more, despite the health and environmental risks. There are already cautions on the cigarette packs of what may happen to you, but, various people don't take them into any consideration. Smoking harms you just as much as it does to the environment. You, smoking, causes pain aimed at yourself and others around you while you're at it. It's not easy to stop smoking, but putting it to a complete halt could save the environment, your life and many others as well. At this point in time in society, more people are turning to transportation which involves fossil fuels that endanger all. Many residents around the world own more than one family car, and each car uses lots of petrol to fuel them and allow them work. The petroleum is then transmitted into the air when the car is in motion, polluting the environment. There's more and more cars being made, and even more petrol being used to make every individual car work. Every second that passes equals more and more pollution being released into the air. People should turn to public transport to reduce individual pollution if they have to use a vehicle. This decreases the effect of petroleum being sent out because less transport would be used. Many factories usually care about one thing and one thing only; money. The environment is being put at a great risk due to their greed. Our goal is to open up their eyes and show them a beautiful world beyond dollars. To do this, we would have to show the companies the consequences without leaving the problem too late. Showing the facts may just get them to see what they are doing, also showing them alternative ways to what they are doing may just get them to reconsider their ways. Because at the end of the day, it will be us who will be paying the price if we fail to stop the issue once and for all. For another way to help reduce air pollution, click here to sign our petition! Remember, every signature counts!